Description: Sweet and dreamy, Orange Dreamsicle is a reminder of those childhood orange push-ups we all loved. 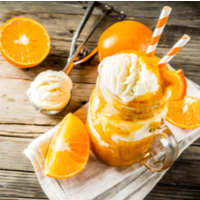 Both you and your customers will have sweet dreams when you use this bestselling blend of orange citrus swirled with creamy vanilla in your products. Reminds me of a summer day from my childhood! I bought 4oz of this and wish I would've bought the 16 oz one. Super strong oob! Cannot wait to make some stuff with this.